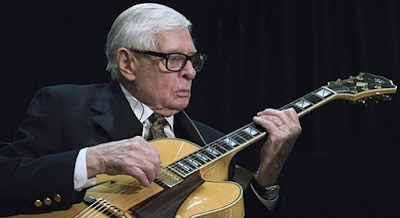 Guitarist Mundell Lowe died today. He was 95. Lowe’s career began at 13 when he frequently went from his home in Laurel, Mississippi, to work at clubs in New Orleans’ French Quarter. After service in World War Two, he honed his bebop skills and became one of New York’s busiest guitarists. He worked with a cross-section of major musicians including the Sauter-Finegan Orchestra, pianist Billy Taylor, and his own quintet at The Embers and other clubs. He was in demand not only as a player, but after he moved to Los Angeles in the 1960s also as a composer for films and television series. For five years in the 1980s, he was music director of the Monterey Jazz Festival. Lowe remained active as a player well into his nineties. One of his happiest occasional partnerships was with fellow guitarist Johnny Smith, another Southerner who was Lowe’s age and whose guitar style also developed under the influence of Charlie Christian. At a 1985 festival in Mobile, Alabama, Lowe and Smith collaborated on Christian’s “Seven Come Eleven.” Despite Lowe’s crediting the composition to Benny Goodman, Christian wrote it in 1940 when he was in Benny Goodman’s sextet and big band. Smith, on your right, has the first solo. The rhythm section is Hank Jones, piano; Monty Budwig, bass; and Alan Dawson, drums.